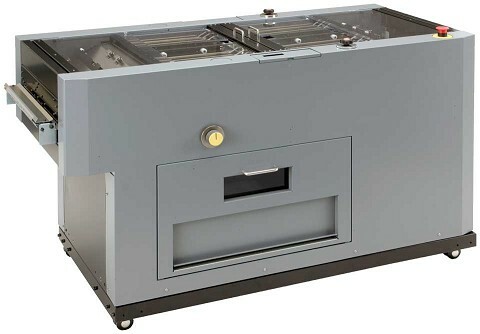 The Slitter/Cutter/Creaser (SCC) unit adds in-line slitting, cutting, and creasing capabilities to the Duplo 600i and 350i Digital Booklet Systems. By adding the SCC to the system, booklets are trimmed at the head and foot for a full-bleed finish and covers and innermost sheets are creased to prevent toner cracking and unattractive fold lines. The CCD scanner can also be added to correct the sheet-by-sheet image shift to ensure accuracy. Add the SCC option to your booklet system to create a complete full-bleed bookletmaking system and reduce multiple set ups and turnaround times! Fine quality paper: 30 to 110 lb. Art/coated paper: 24 to 110 lb. Fine quality paper: 16 to 32 lb. Art/coated paper: 24 to 40 lb.